We start with two well deserved 5th Birthday celebrations. Push The Button celebrates its 5th birthday at the Royal Vauxhall Tavern (372 Kennington Lane, SE11 5HY) on Friday 27 November. Advance tickets are selling quickly and this will be a sell out. We Party celebrates five years of consistently pulling in the crowds and high production values at The Electric Brixton (Town Hall Parade, SW2 1RJ). Advance tickets are on sale now. 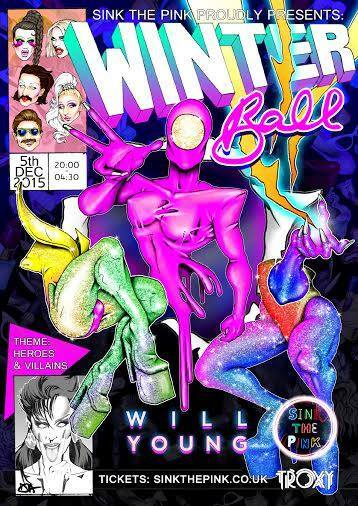 Sink The Pink’s Winter Ball returns to Troxy (490 Commercial Road, E1 0HX) with special guest Will Young The theme this year is “Heroes and Villains”. Advance tickets are on sale now. This will sell out. 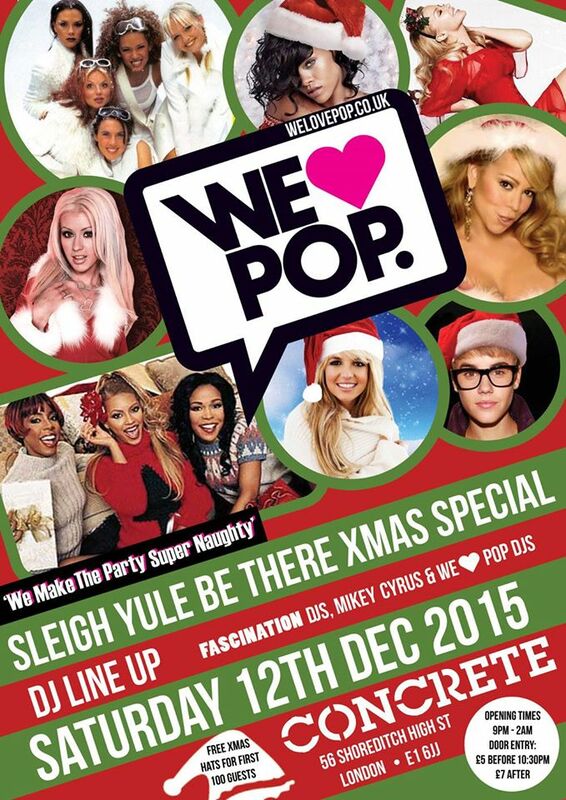 We Love Pop Club’s final night of 2015 at Concrete (Lower Ground Floor, 56 Shoreditch High Street, E1 6JJ) is dedicated to Christmas Hits and classic songs from The Spice Girls, Britney Spears, Girls Aloud, Beyoncé, Kylie Minogue. £5 advance tickets are on sale now. 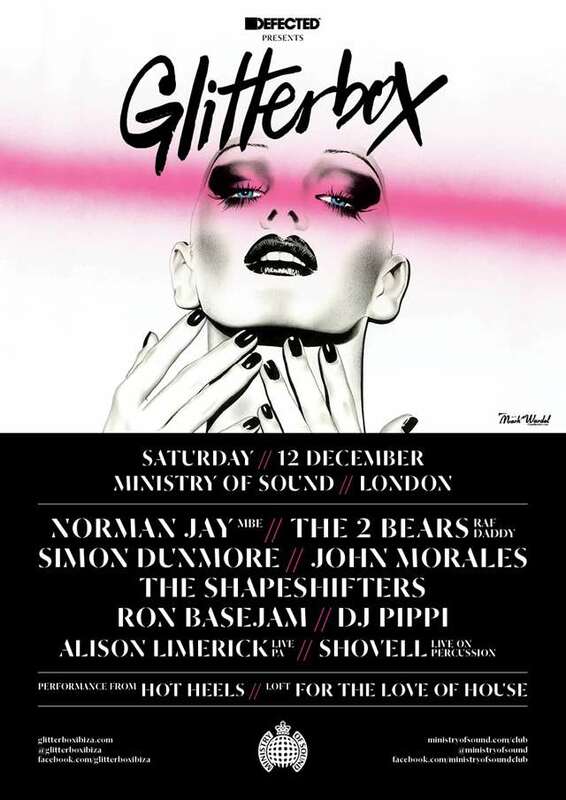 Glitterbox returns to the Ministry of Sound with a stellar line-up that includes no less than Norman Jay MBE, The 2 Bears, The Shapeshifters, John Morales and DJ Pippi and a live PA from Alison Limerick. Advance tickets are on sale now. Village Drinks hosts its Christmas drinks party at The Shadow Lounge (5 Brewer Street, W1F 0RF) from 6.30pm to late. Advance tickets are on sale now. One of the most quintessentially Soho nights, Room Service, goes east for one night only, to Dalston Superstore (117 Kingsland High Street, E8 2PB). Doors open at 9pm. Jodie Harsh, HiFi Sean, JoshYou Are and Lady Lloyd play. Note this is the last Room Service event in London for 2015 and there is no Room Service on Christmas Eve not New Year’s Eve. Andy Almighty presents Anthem’s Old Skool Reunion Christmas Party at the Royal Vauxhall Tavern (372 Kennington Lane, SE11 5HY) from 10pm. Andy is joined by Sean Sirrs in the DJ booth. London’s very own Horse Meat Disco play an all night set at Phonox Brixton (418 Brixton Road, SW9 7AY) on Friday 18 December. A good chance to see Horse Meat Disco in London outside the usual Sunday school night. Entry is free before 9pm. Tickets are £10 on the door afterwards. One of the more successful club night launches in recent years, Brut returns for its 13th outing at The Steel Yard (13-16 Allhallows Lane, EC4R 3UL) from 10pm on Saturday 19 December. Advance tickets should be on sale shortly. The following bars & clubs are confirmed to be closed on Christmas Eve: The Eagle, Vauxhall; Room Service, Soho; New Bloomsbury Set, West End; Freedom Bar, Soho; G-A-Y Late; Soho. The following bars & clubs are confirmed to be open on Christmas Eve: G-A-Y Bar, Old Compton Street; The Two Brewers, Clapham. The following bars & clubs are confirmed to be open on Christmas Day: The Two Brewers, Clapham (from 7pm). The following bars & clubs are confirmed to be closed on Boxing Day: Freedom Bar, Soho; G-A-Y at Heaven. This entry was posted in London - City Wide and tagged Christmas, Gay, London, Music. Bookmark the permalink.